One of the least predictable Champions League finals in recent seasons ended with a penalty shootout, as Real Madrid won this trophy for the second time in 3 seasons. The early goal meant that this game took on a different shape, and was a far cry from the derbies of the past few years. Zinedine Zidane didn’t spring any surprises, naming the first choice XI that defeated Barcelona at the Camp Nou. Casemiro played in front of the settled back 4 along with Kroos and Modric in a midfield trio, while the famed ‘BBC’started up front. It was a 4-3-3 on the ball, although Real retreated into a 4-5-1 off the ball. Diego Simeone opted for the physically dominant Stefan Savic at the heart of defense alongside Diego Godin, benching Jose Maria Gimenez, who struggled at points during Atletico’s previous game in Munich. Just as they did against Barcelona and Bayern Munich, Atletico adopted a higher line and looked to press Real Madrid during the opening stages of the game. Pressing a Guardiola side, or one that plays like his teams, often leads to early goals as they struggle to settle down. But pressing a Real Madrid team with Bale and Ronaldo on the wings could, ultimately, prove counter-productive. Zidane was well prepared for the early press, and he directed his players to launch long balls at the front 3 to bypass Atletico Madrid’s midfield. This was crucial as it forced Atletico Madrid’s back 4 deeper to contain the pace of Ronaldo and the dangerous Bale. Usually Simeone’s side manage to deal with aerial barrages, but their caution must have been due to the fact that this was a final. With a deep back 4, it’s of no surprise that the midfield struggled to close down Kroos and Modric as quickly as they would have liked. Real Madrid made plenty of passes in the mdidle third of the pitch while Atletico looked to press, which spoke volumes about their organization. Off the ball, Real were relatively adventurous during the opening 20 minutes. They operated in a 4-1-4-1, with Casemiro sitting in front of the back 4 and Ronaldo, Bale, Kroos and Modric alternating and pressing with Benzema. Crowded out in midfield, Atletico were forced to thump long balls wide. Juanfran played long forward balls the most, but Fillipe Luis became the recipient of most long passes by half time. Real Madrid easily recovered long balls, launching fast attacks. With Kroos and Modric attempting long passes, Ronaldo would drift centrally, and the front 3 generally exchanged positions throughout. Bale was the most dangerous on the ball. Atletico were consistently forced into tactical fouls as Real Madrid’s attackers exploited the space between their midfield and defense. Indeed, Atletico committed the same number of fouls in the first twenty minutes as they did in the following hour. This led to one brilliant chance for Casemiro, and Sergio Ramos’ goal. Of course, the goal forced Atletico forward and changed the nature of the game. While it was entirely plausible that Atletico could, at least partially, abandon their compactness during an opening press, only an early goal could force them to venture further forward. This meant that the opening period was not an exception, the back 4 often sat slightly too deep in an attempt to prevent Real Madrid’s counter attacks. The early goal and the presence of Casemiro allowed Real Madrid to sit deep. This was essentially a role reversal, Atletico were now the side playing passes out wide with little inspiration, while Real Madrid were very compact, vertically but also horizontally, in a 4-5-1. Simeone’s men were the ones sending crosses into the box, although Griezmann and Torres represented little aerial threat against Pepe and Ramos. Atletico never looked like they would break through unless Simeone brought on Carrasco to help one of his full backs; Ronaldo and Bale did a great job tracking back during the first half to prevent their overlapping runs. This was a challenge which Atletico were yet to overcome; both Bayern and Barcelona (until the Copa Del Rey final, at least) would continue to hold high lines when up 1-0, but Real Madrid were willing to cede possession and commit fouls. Casemiro was spectacular in his holding role; while its hard to remember a specific crunching tackle he made, the Brazilian was crucial even in extra time, stopping mazy dribbles and retaining the ball with neat distribution. The lack of a big moment to sum up Casemiro’s match is misleading, he was arguably the best player on the pitch. In many ways this was a similar challenge to the one Simeone faced in October at the Calderon, when Real Madrid took an early lead via Benzema, only for a late equalizer from Luciano Vietto to end the match as a draw. But this time, there would be no Arbeloa to give his side a way back in. Simeone made the expected substitution, taking off holding midfielder Augustō Fernandez for winger Yannick Ferreira Carrasco, just like he did in Munich. Carrasco played on the left, while Griezmann drifted to the right. Gabi played as a destroyer while Koke and Saul roamed between the lines. Koke in particular found plenty of time on the ball. The opening to the half reflected both side’s mindsets. Atletico began pressing, while Pepe launched a long ball to bypass the press. The back 4 recovered the ball and it was worked forward to Torres, who was brought down by Pepe, but Griezmann missed the penalty, again, against Keylor Navas. At this point Real were looking to play almost exclusively on the counter, while Atletico began to take the initiative with the ball. Even in their new 4-3-3/4-2-3-1 shape, however, they struggled to create chances, often running into a resilient Real Madrid back 4. Ronaldo and Bale were still tracking back at this point. Much like in the 1-1 draw at the Calderon, Daniel Carvajal’s injury changed the game. Sitting deep, Real Madrid had few weaknesses in terms of personnel off the ball, but Danilo’s entrance gave Atletico a window of opportunity. The former Porto man has struggled defensively this season, and had to deal with Carrasco, who had done little of note prior to his entrance. Zidane must have recognized this, and while some may criticize his substitutions, his hand was forced in each case. Danilo was the standard replacement for Carvajal, while Kroos’ injury meant Isco was sent onto the pitch,, but the Spaniard acquitted himself quite well. Benzema was tiring, and Lucas Vazquez was the logical replacement, the winger would afford protection to Danilo as well. If anything, he could have subbed off Ronaldo, although Benzema might not have lasted 120 minutes. But with Ronaldo and Bale tiring, and Benzema squandering Real’s best chance to go 2-0 up it was Danilo (and Vazquez) who watched on as Carrasco scored. The creativity for this goal originated from the opposite flank, however, and it was the result of an Atletico overload. But Danilo lacked confidence off the ball, a feature of his previous performances this season as well. Ronaldo and Bale had tired at this point, and were not tracking back as they were during the first half. The goal also came as relief for Atletico Madrid. Despite bossing possession, they barely created enough quality chances, especially considering Real Madrid did with far less of the ball. It also allowed Simeone’s men to sit back; they had been venturing forward ever since Ramos’ early goal. The last 15 minutes of normal time finally saw Atletico retreat into a shell and Real Madrid knock the ball around in the opposition half. Both sides had been tiring, but Atletico were the side who controlled the ball during this period. In an attacking sense, the key man for Atletico Madrid was Carrasco once again. He was the most lively attacker on the pitch- Bale could barely walk while Ronaldo was not fully fit, and Griezmann had been marshaled well all game long. But Fillipe Luis’ injury gave him less support, and forced him into more take-ones. Lucas Hernandez, Luis’ replacement, wasn’t particularly helpful either. Therefore, while Carrasco attempted more flashy dribbles, he was less effective against Madrid’s right-sided duo in Danilo and Vazquez. 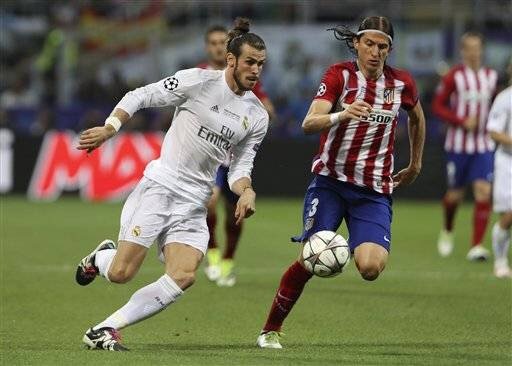 Atletico as a whole struggled to create chances once more during extra time, and committed the same error of defending too deep to stop the pace of Gareth Bale, even though the Welshman was practically limping through extra time. When they did look like they could break through, it was Casemiro who made intelligent tackles to keep Atletico at bay. Danilo and Vazquez also represented Real Madrid’s best chance to score, along with Isco. All 3 were substitutes, and asked questions of Atletico Madrid’s defenders. Danilo even drew a save from Oblak shortly before the end of extra time. Isco in particular impressed with his slaloms through midfield, although his end product was still lacking. Despite sitting back, Real Madrid still looked the more dangerous side on the break. A fully fit front 3 might have put this game to bed sooner than anticipated, as Simeone’s side never, apart from a spell during the second half, looked up for the task of fighting back from a goal down. Real Madrid ultimately won through a Cristiano Ronaldo penalty, but they stayed in control throughout regulation time by going ahead through a set-piece, then sitting back and forcing Atletico forward, before playing on the counter. This is far from a new blueprint for the winners, they played the same way to beat Bayern Munich 4-0 en route to their 10th European Cup. It is interesting that Zidane employed a similar tactic against Atletico, however, considering that they are a far different side. Nevertheless, it was an. effective, if not aesthetically pleasing style. As for Atletico Madrid, this was a cruel defeat. They were the best side in Europe, at least defensively, and proved to be extremely versatile against Bayern Munich. But they were undone by a set-piece here, something which they haven’t defended against as well this season. This is a natural by-product of Atletico’s progress; it’s hard to imagine last year’s side conceding a goal from a set-piece in this manner. It is also hard to imagine last year’s side putting up a fight and controlling proceedings as this side did. It will be interesting to see how Simeone improves this team; surely they will return to the semi-final stage next season.